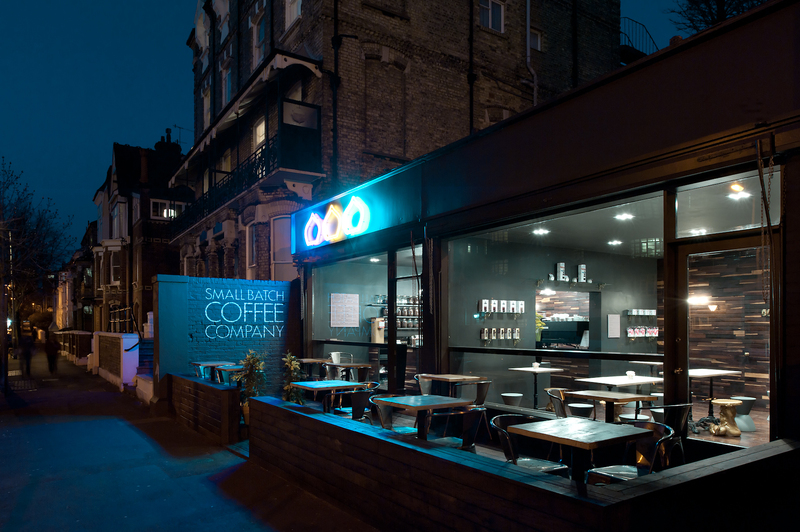 At 55m2 and with striking innards, the Small Batch Coffee Company on Wilbury Road in Hove is both small and perfectly formed. The two qualities made it an ideal candidate for the World Architecture News Retail Interiors Awards 2011 in the less than 200m2 category. I know the Goldstone Villas branch of Small Batch well as I pass it almost every day on my way to the station. The Wilbury branch looks totally different though, having been created in parallel with an ambitious rebranding exercise that was also embraced in the design of the firm’s newest branch on Jubilee Street in Brighton, and in the update of the Small Batch coffee carts outside both Hove Station and Brighton Station. Paul Nicholson and Damon Webb of Chalk Architecture really have carved out a niche for themselves in creating luscious commercial interiors, often in a hospitality setting. Whether it be the Connaught Pub on Hove Street, Yellowave Barefoot Cafe on Madeira Drive, Molly Malone’s on West Street, or the Dyke Road Tavern on, well, Dyke Road, Chalk’s interiors never fail to impress. 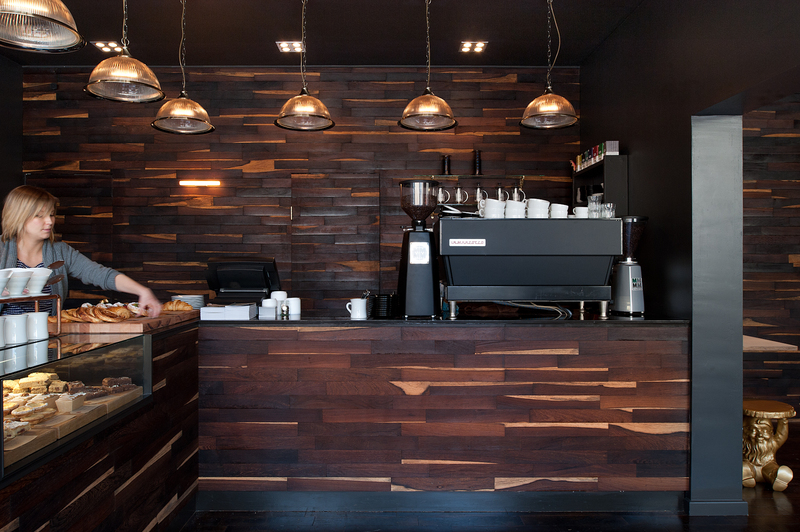 The Wilbury interior is both moody and welcoming, and is characterised by quality dark hardwood throughout; Teak on the floors, Panga Panga on the walls and counter. The remaining surfaces are either covered with grey high-gloss porcelain tiles or dark grey paint. Seating includes slightly creepy Phillipe Starck Golden Gnome stools, and a set of custom Chalk-designed chairs (which appear in the window of Chalk’s new shopfront on Tidy Street in the North Laine) that incorporate the new Small Batch logo. Wilbury Road itself consists of a series of large late-Victorian villas. By fronting that road, Small Batch is slightly off the beaten track of Church Road (though its address is technically 67 Church Road). Some of my favourite buildings in the whole of Brighton & Hove are on Wilbury including Toad Hall and Wilbury Lawn (not forgetting every single mews house on Wilbury Grove). The dark painted exterior of Small Batch fits in well and includes the new logo which can be seen clearly from Church Road. I was taken by the interior but I adore the logo above all else which Paul described by text message as “3 domes, a la pavilion”. World Architecture News must have been impressed too with the whole project, when Small Batch on Wilbury Road was Shortlisted for its prestigious Retail Interiors Award.